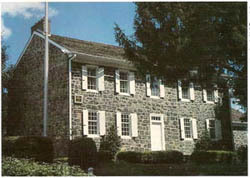 This years reunion will be based in Newark, DE with three days of exploration in Delaware, Maryland and Pennsylvania. Our headquarters location will be the Embassy Suites by Hilton — Newark Wilmington South (see additional info on hotel rates and reservations below). Reunion registration for attendees will kick off at 4 pm at the Embassy Suites, followed by the the hotel reception and / or dinner on your own. 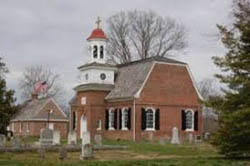 St Mary Anne Episcopal ChurchA Elk Landingf Partidge Hillter that exhausting day, we will spend Friday in Maryland. We will take a car caravan to visit St. Mary Anne’s Church in North East. Zebulon Hollingsworth was involved there. We then go to Elk Landing in Elkton, where we can see our “treasures,” a Bible and a quilt, before heading off to lunch at the American Legion (formerly Partridge Hill, built by Henry Hollingsworth in 1790). We will have our annual meeting there and then return to the hotel. Dinner is on your own. 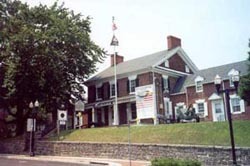 Museum of the American RevolutionS Valley Forgeaturday is our day in Pennsylvania learning about the Revolutionary War. 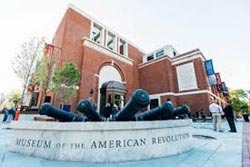 We will board our bus to go to the Museum of the American Revolution — it opened relatively recently, and I have heard nothing but good reports about it. Lunch will be at the Reading Terminal before we head to Valley Forge. Allegedly, three Hollingsworths were there. Henry is the only one we can trace back to Valentine, but our genealogist says Henry wasn’t there. Nonetheless, our kinfolk, Quakers though they were, fought during this war. 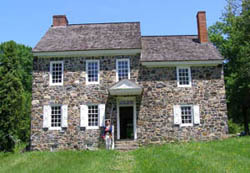 After a two-hour tour of Valley Forge, conducted by Susan Aggarwal, we will return to the hotel. Dinner is on your own. There is a TGI Friday’s connected to our hotel. All two-room suites with sleeper sofa in the living room, two TVs, refrigerator, microwave, and coffeemaker. Shuttle to and from Philadelphia Airport to Embassy Suites, Newark, Del. What you and I call shuttles, Delaware Express calls a portal. If you fly into PHL, you can arrange a shared ride (shuttle) or a solo ride (portal) should you not want to rent a car. If you have any problems setting up your shuttle/portal using the link above, you can call Delaware Express Customer Service at 800-648-5466. Attendees gathered in Dallas at Embassy Suites, Dallas DFW Airport South. The first full day, Thursday, began with a tour of Fort Worth, stopping at the Fort Worth Water Gardens and Sundance Square. 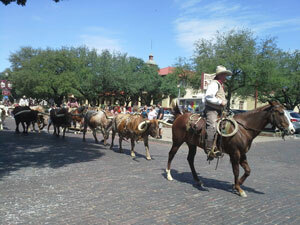 The next destination was the Fort Worth Stockyards featuring the historic cattle drive. After lunch on our own, we departed for a self-guided tour of the U.S. Bureau of Engraving and Printing. 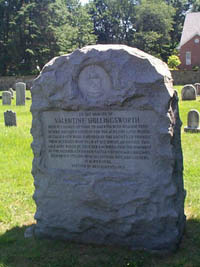 Greenwood Cemetery and Oakwood Cemetery were the next stops where five descendants of Valentine, Sr. are buried in each cemetery. Dinner was awaiting our group at Joe T. Garcia’s Mexican Restaurant. Dallas/Fort Worth National Cemetery with four burials of veterans who were descendants of Valentine, Sr. was our first stop on Friday morning. Next was the John F. Kennedy Memorial and a self-guided tour of the Sixth Floor Museum at Dealey Plaza. Lunch was at the revolving restaurant atop Reunion Tower. 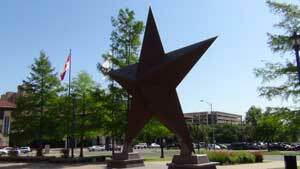 A self-guiding tour of the George W. Bush Presidential Library and Museum was our next event. A visit to Sparkman-Hillcrest Memorial Park was a tribute to one of Valentine, Sr.’s descendants buried there. Our seats had been arranged for dinner and a jousting tournament at Medieval Times. Saturday morning we traveled to Tom Bean, Grayson Co., Texas, to visit White Mound Cemetery. 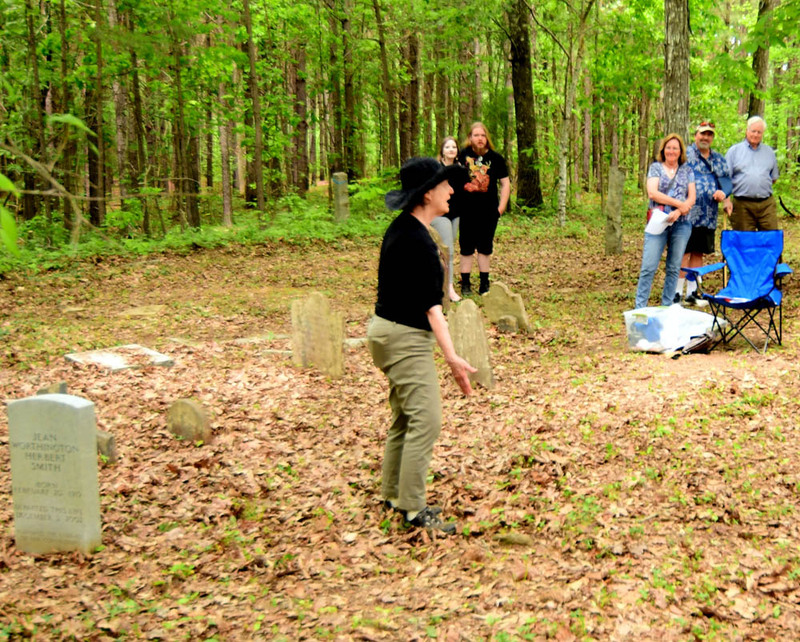 Carey Hardy provided stories about his ancestors buried there. Lunch had been prepared for us at Rick’s Chophouse in McKinney, Texas. The county seat of Collin Co., McKinney was named for Collin McKinney, a signer of the Texas Declaration of Independence. Rick’s Chophouse is located in an historic hotel that dates back to 1885. The restaurant is decorated with restored repousse (pressed tin) ceilings, leather, and dark mahogany wood. The ambiance is enhanced with wrought-iron chandeliers, Western pictures, limestone walls, and wood floors. Back at our headquarters hotel, we had a couple of hours to relax before the hotel’s barbecue buffet dinner. The final event of the reunion was the Annual Meeting at the hotel. To honor some of our Hollingsworth veterans buried in Dallas and Fort Worth, a small bouquet of flowers was placed at a veteran’s gravestone (or at the cemetery entrance if the burial location was unknown). Placing a bouquet at Oakwood Cemetery was Dewey Hollingsworth, at Sparkman/Hillcrest Memorial Park was Kathy Hutchison, at Greenwood Cemetery was Betty Hebert-Reese, and at Dallas/Fort Worth National Cemetery were John P. Hollingsworth, Pat Neal, and Boyd Hollingsworth. 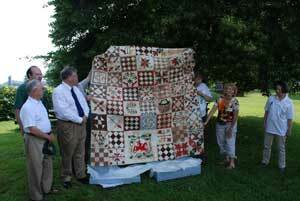 Each year, members of the Descendants of Valentine Hollingsworth Sr. Society gather together to renew family ties. The reunions are generally held over a three day period and the location is moved to different locations around the country that have significant Hollingsworth heritage or are of significant interest to DVHSS members. 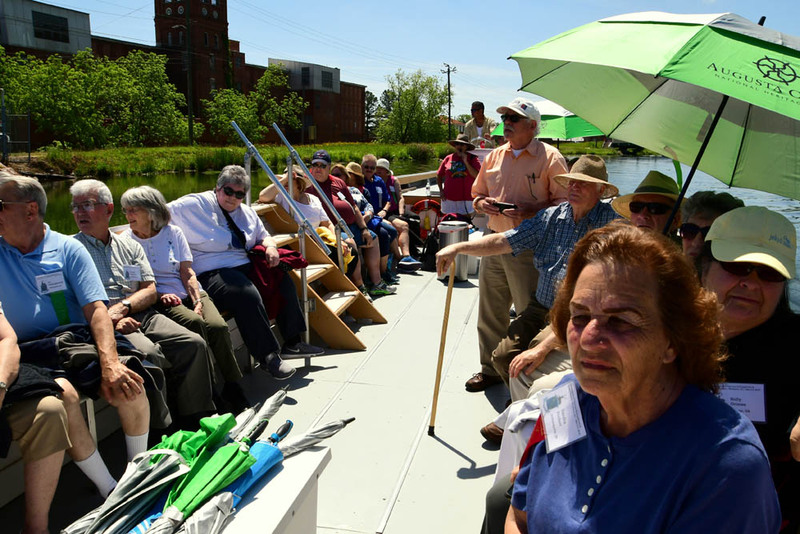 The reunions generally include a day focused on touring one or more local Hollingsworth sites and a day devoted to the general sites of interest in the local area that cousins from other parts of the country may not have seen before. The third day is devoted to the Societies annual business meeting and to additional Hollingsworth interest sites. Two of the three days generally include a group dinner, often at a location that also has Hollingsworth connections. 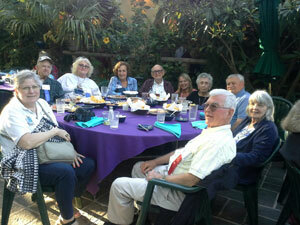 The reunions are a great way to get to know your Hollingsworth cousins and are always informative and enjoyable. 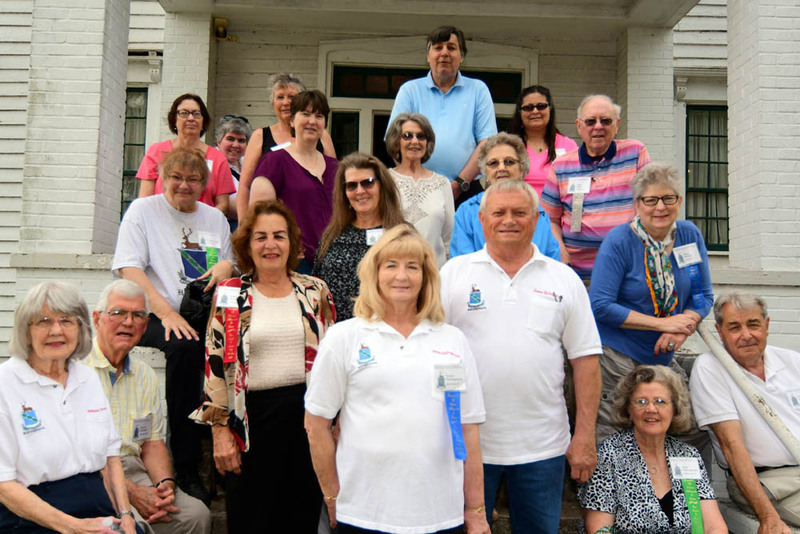 They also provide an opportunity to discuss your Hollingsworth genealogy questions with other members from your Hollingsworth line and with organization genealogists. You do not have to be a member of the DVHSS to attend the reunion, although pre-registration for the event through DVHSS is required. Additional information on this year's reunion and on prior year reunions are included in the other articles in this category. 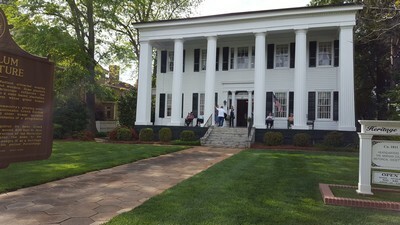 The 2016 Hollingsworth Reunion was a four day event held from Wednesday April 20th through Saturday April 23rd, centered on the beautiful city of Atlanta, Georgia and a region rich in Hollingsworth history. Reunion activities kicked off on Wednesday morning when our early-bird members took a three-hour, guided bus tour of Atlanta. After lunch at the CNN Food Court, most of the members of the group chose a museum for their afternoon tour, including the Georgia Aquarium, the Center for Civil and Human Rights Museum, the Centennial Olympic Park, In Studio Tour at the CNN Center, the College Football Hall of Fame and Museum, and the World of Coca-Cola. 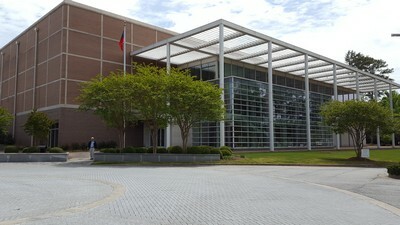 Some also took advantage of the Georgia State Archives, located justdown the road from our hotel, to do some genealogy research. The archives is a treasure trove of information regarding early Georgia history in a state where researchers often face challenges resulting documents lost in court house fires before, during and after the Civil War. On Wednesday evening, members were on their own to sample some of the exellent restaurants that wee in the area of our hotel. On Thursday our group opened the Atlanta History Center and was given a 90-minute guided tour of “The Turning Point: The American Civil War.” We were priveledged to have an excellent guide who pointed out a number of unique items in the Turning Point exhibit. These included the flag that flew over Atlanta when captured by General Sherman's forces and one of the supply wagons used by Union forces that captured the town. The History Center includes a number of other interesting exhibits and members had the opportunity to visit those as well. Our band was then treated to a delicious light lunch in the formal BelleNita Room of the Swan Coach House, located on the center’s grounds. 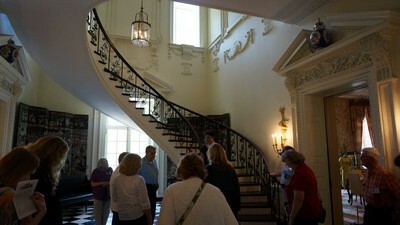 Next stop was a guided tour of the Swan House, a 1920s Atlanta mansion, located down the hill from the Coach House. It is preserved as it was in the 1930's and the tour was provided by a guide costumed in 1930 era fashions and who provided insight into the life of the Atlanta rich and famous in the 30's. Also of interest is that the house was a movie set for one of the recently popular Hunger Games movies.The remainder of our time at the center’s main campus was spent wandering the gardens or visiting other exhibitions. Our finale for the day was a guided tour of the original Margaret Mitchell House (author of Gone With the Wind), which was done exceedingly well. 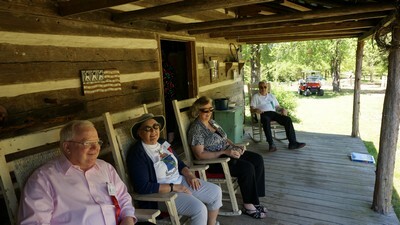 Friday’s first stop was at the Rex Mill in Rex where Jerry and Gayle Beddingfield greeted us when we departed our bus. 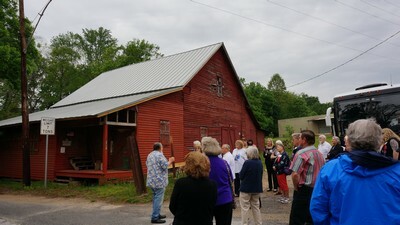 Jerry took us through the mill’s history from its construction in 1835 by Isaiah Hollingsworth to the present. 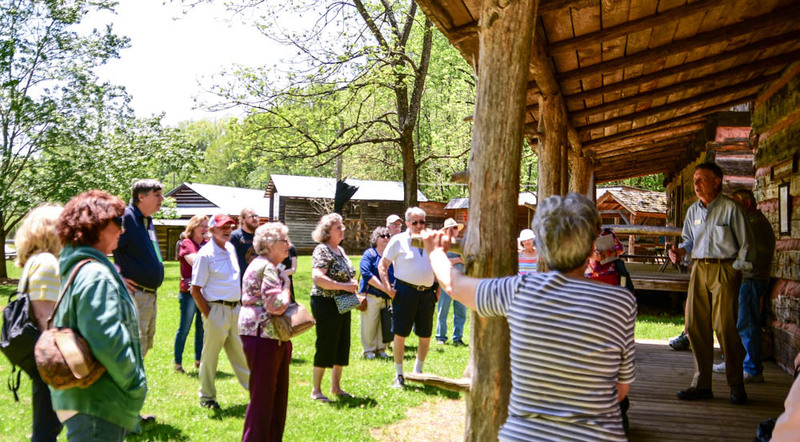 While the mill, listed on the National Register of Historic Places, is no longer functional, many area residents still remember it in the days when it functioned as a grist mill for local farmers. The Beddingfield’s are working hard to repair the mill and bring it back to life. Their warm hospitality made our departure difficult. 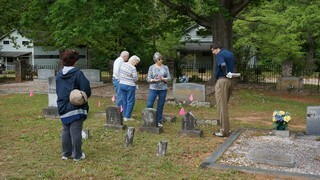 The Smyrna Presbyterian Cemetery (SPC) in Conyers was our next destination. We were met by a dozen members of the SPC Trust who had flagged all of the Hollingsworth graves. 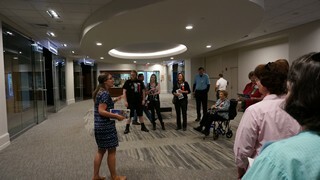 In addition to their heartfelt welcome, the group offered help locating our ancestors. Our gracious hosts even passed out water bottles to those needing refreshment. The attention to detail by our hosts made this stop memorable. Our group stopped for lunch at the Monastery of the Holy Spirit and visited the Abbey to hear the Gregorian chant. Traveling east, our merry band was treated to a guided bus tour of Madison, “the town Sherman refused to burn.” The tour included stories of the Southern antebellum homes and their residents and a tour of Heritage Hall. 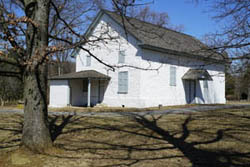 This Greek Revival style home was built in 1811 and served as a private home for multiple families through 1977 when it was gifted to the local historical society. 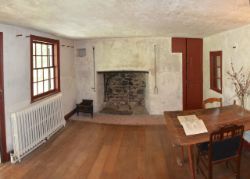 The home is decorated as it would have been in the 1800's and provided members with a feel for life during that period. An exquisite buffet at the Blue Willow Inn on the journey home completed a long day for our weary travelers.Everyone was encouraged to consider eating desert first so as not to miss the Peanut Butter Pie for which the Blue Willow is famous. Saturday was our “Day at the Fort", and our day could not have been better. 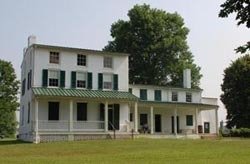 Fort Hollingsworth, which was built in 1793, is the last surviving fort on what was at the time of its erection the Georgia Western Frontier fort. Due to a mistake in the initial boundary survey, the initial settlers in the area learned too late that they were actually on Indian land, and the local Native Americans were not happy with their presence, often raiding the settlers. This necessitated the building of forts until a new treaty could be settled that finally secured the land. The weather was marvelous for our visit, and the costume portrayals by the Northeast Georgia History Organization were wonderful. However, best of all were the Hollingsworth relatives that welcomed us. A tasty Southern barbecue completed the perfect afternoon. 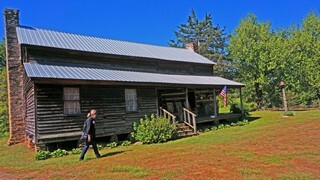 The day concluded at the historic Wayman Hollingsworth House in Fayetteville, where Angela Pendleton of the Fayette Co. 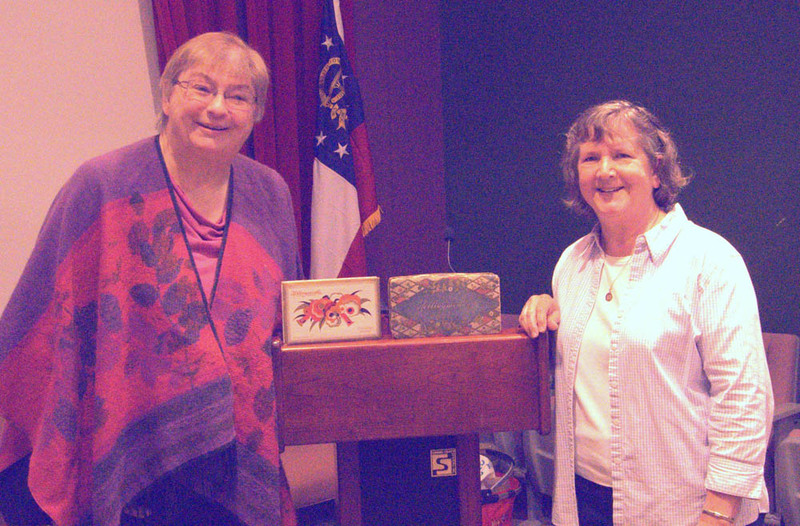 Historical Society spoke to us on Fayetteville history. The DVHSS annual meeting after a catered dinner put the final touches to the week.